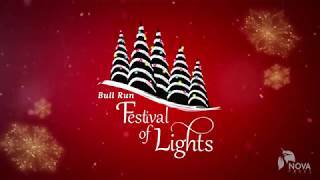 Every year from Thanksgiving until just after New Year’s Day, you can experience the Bull Run Festival of Lights, 2.5 miles illuminated by holiday light displays. Drive the festival route from the comfort of your car; turn out your headlights and just follow the magical glow. After viewing the lights, bring your family and friends to the holiday village to enjoy rides, refreshments, and of course, photos with Santa Claus (holiday village open select nights). The festival happens annually at Bull Run Regional Park in Centreville, Virginia. Want to avoid the crowds? Fridays, Saturdays, and Sundays are our busiest nights. Please take advantage of the Monday through Thursday discounted price and avoid a long wait. Look for our special online coupon in the downloads section below! The Bull Run Festival of Lights is now closed for season. Thank you so much for being a part of our wonderful winter experience! See you next year! (Holidays include November 22, December 24, 25, 31, and January 1). The Bull Run Festival of Lights is now closed for season. 2018 Festival of Lights Online Coupon!